If dependency is not found in these repositories, maven stops processing and throws an error. Maven local repository is located in your local system. It is created by the maven when you run any maven command. By default, maven local repository is %USER_HOME%/.m2 directory. For example: C:\Users\SSS IT\.m2. 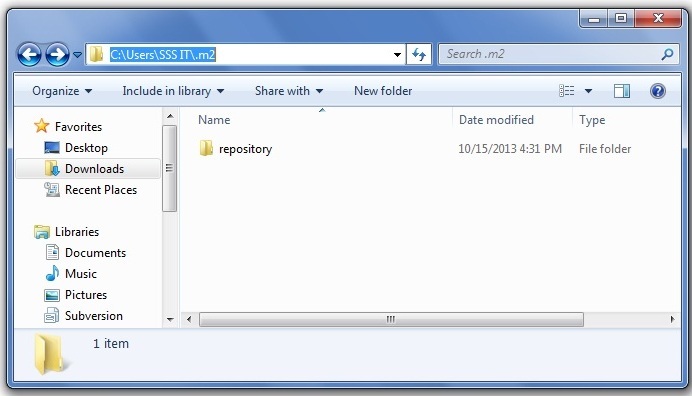 We can change the location of maven local repository by changing the settings.xml file. It is located in MAVEN_HOME/conf/settings.xml, for example: E:\apache-maven-3.1.1\conf\settings.xml. Let's see the default code of settings.xml file. As you can see, now the path of local repository is e:/mavenlocalrepository. Maven central repository is located on the web. It has been created by the apache maven community itself. The path of central repository is: http://repo1.maven.org/maven2/. The central repository contains a lot of common libraries that can be viewed by this url http://search.maven.org/#browse. Maven remote repository is located on the web. Most of libraries can be missing from the central repository such as JBoss library etc, so we need to define remote repository in pom.xml file. Let's see the code to add the jUnit library in pom.xml file. You can search any repository from Maven official website mvnrepository.com.